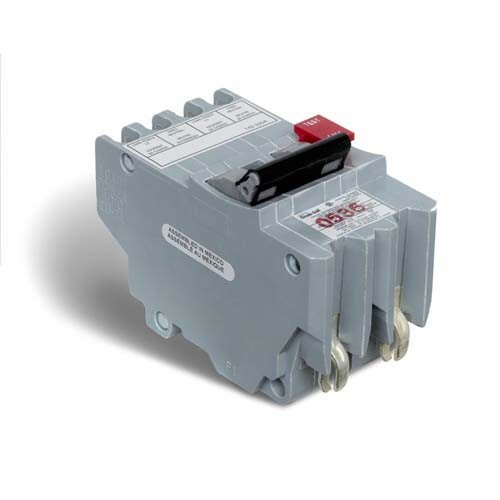 Federal Pioneer Ground Fault circuit breaker 120V plug in 2-pole unit 1 inch thick or full size . Not interchangeable with any other. NAGF230 Originally made by Federal Pacific Electric, then Challenger, then Federal Pioneer. A bolt-on version is also made called an NB type. Typically used in schools or commercial applications, but rarely for homes. First color available will be shipped. Breakers were also made in the past by Federal Pioneer, American Circuit Breaker Co. and a knock off by Connecticut Breaker Co. which presently holds the rights to the brand name. The Federal Pioneer Ground Fault circuit interrupter protects people against electrical shocks. GFCI protection is required in wet or damp areas such as bathrooms, kitchens, garages, spas, pools and outdoor receptacles. Do not connect to more than 250 feet of load conductor for the total one-way run to prevent nuisance tripping. Note: submersible pump installations require ground fault protection to the maximum sensitivity level of 10mA. Provides overload, short circuit protection combined with Class A ground fault protection. Class A denotes a GFCI that will trip when a fault current to ground is 5 milliamps or more. Use solid conductor only when #14 wire is used.